If you would graph those that lost their job since 2007 and those that did not lose their job since 2007, I am pretty certain then that a similar pattern could be found: the increase in debt-to-nominal income of the unemployed is wholly a result of a decrease in nominal income. Similarly, you could probably find such a relationship between debt-to-nominal income of the unemployed and the employed, and change in nominal income for almost any set of consecutive years in the great moderation. What would the difference be between that graph, and the graph above, that makes you conclude that the euro debt crisis is a monetary crisis? Alternatively, as I read you, it is not so much the slope of the line that makes it a monetary crisis, as it is the sheer size of it; had NGDP been humming along then the numbers on the axes would have been a lot smaller. Martin, it is really very simply. The ECB is fully in control of NGDP. The ECB has consistently allowed nominal GDP to decline and euro zone nominal GDP is well-below the the pre-crisis trend due to the extremely tight monetary policy in the euro zone. In a monetary union, is the central bank also 100% responsible for the NGDP growth of every arbitrary geographical area in such a union? I am not disagreeing with you here that the central bank let NGDP-collapse and that this is a big part of the problem; I am disagreeing with you however that the slope of the line shows that the debt crisis is a monetary crisis. You could draw a sloped line regardless, provided you get to pick the area with the shocks. What shows that this is a monetary crisis, is that the abscissa ranges from -20% to +25% for 2007-2012 and the assumption that no observed real shock could be wholly responsible for such a difference. The slope of the line is the result of asymmetric shocks; the numbers on the axes are the result of bad monetary policy exacerbating these shocks. I think you confuse correlation with causation. Jan, no…but you might have a better explanation? I would say that too much (mostly private) debt led to tight monetary conditions. 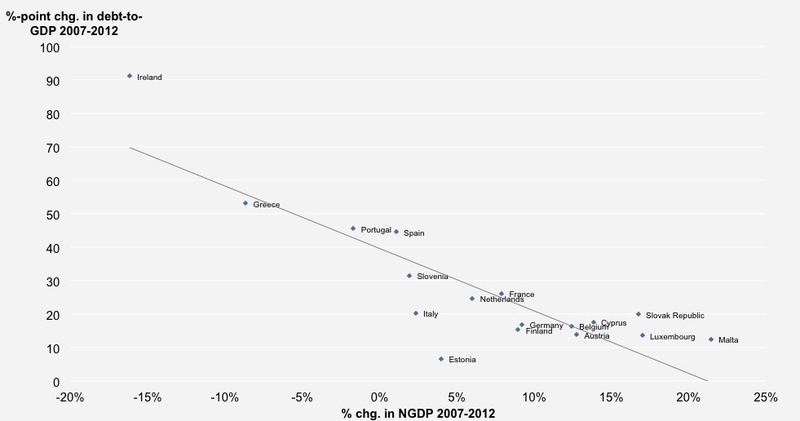 But I do agree that a serious increase in NGDP for the Eurozone would be healthy for the Eurozone. So too high taxes didn’t seem to be their biggest problem when the crisis struck them. I think there is an error in your graph. Slovakia’s NGDP is forecast to increase by 30.9% between 2007 and 2012 according to Eurostat. This is important because it makes Slovakia the second largest outlier, not Estonia. I agree with your interpretation concerning Ireland. It took on about 40% of GDP in bank debt. I would be careful about making any policy judgements concerning Estonia. On question. The ECB could only target NGDP growth of europe not of every single country. Suppose they would have hit NGDP growth target but greeks NGDP would still have fallen. How would you address that? Is that even possible to happen? Is that even possible to address? I think there is a slight mistake in the graph. Slovakia’s NGDP is forecast increase by 30.9% between 2007 and 2012 according to Eurostat. Thus it is the second largest outlier, not Estonia. I agree about Ireland, as the bank debt it took on was about equal to 40% of GDP. And I’m curious why Estonia has done so well, but I don’t think this is can be at all interpreted as evidence in favor of a successful internal devaluation. Even Scott Sumner acknowledges that within a monetary zone local fiscal spending changes local GDP. In fact he has used this fact to deride studies estimating fiscal multipliers based on differences in state and local spending. Thus were Greece to cut government spending even more severely, its NGDP would have course dropped even more. Excellent blogging. The theo-monetarists are obsessed with inflation, but I would prefer we get obsessed with growth. Lars, what do you make of CEE economies like Serbia, where they are in recession but also have consumer price inflation? Not sure if CPI inflation is the right benchmark to look at, but would be curious as to your thoughts. Here is the fine analysis with no hope of any particular solution to an unnamed problem. What is the crisis that we speak of here? Is it one in which governments cannot pay their debts? Is it one of lack of jobs for those who want to work? Is it an inability of the people of a country to live decent and fulfilling lives? Something else entirely? Look, if we are feeling sorry for banks (holders of the unpayable debt) have the ECB make some money and give it to them. Done. If we people can’t find employment, make some jobs doing what needs to be done in the various countries and pay the people with money created by the ECB, or tax the rich sufficiently in order to pay those working. Done. If all the necessary and desirable work is done, print some money and give it to the citizens so that they need not needlessly suffer and they will be able to purchase the available goods and services to make their lives better. Done. Sitting around and making graphs and trying to figure out if Europe is in a debt crisis or a monetary crisis does nobody any good whatsoever. It fosters a ridiculous attitude of “we can’t do that!”. Yes, we can. And we should.